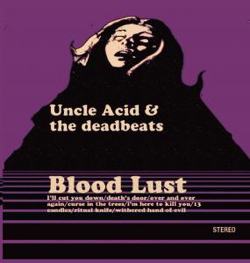 Who are this mysterious cult phenomenon known as Uncle Acid & the Deadbeats? We are not able to shed much light on the identity of this drug-crazed coven of freaks but their addictive blend of heavy, melodic and garage horror-rock sounds have already taken the underground by storm. The popularity of this as yet anonymous bunch initially stemmed from people discovering tracks uploaded by them to Youtube, without any other hype. Two extremely limited self-financed mail order only Cd-r only albums were released (Vol 1 & Blood Lust) and interest in the band grew rapidly. A vinyl edition of Blood Lust was released by Rise Above Records in 2011, which sold out instantly. Demand for this vinyl edition of their second album set the record collecting market on fire, with first pressing copies fetching up to £700 on eBay. It was re-pressed on vinyl a second time earlier in 2012 and again sold out in minutes with the Rise Above Records website crashing under the strain of a staggering amount of hits.